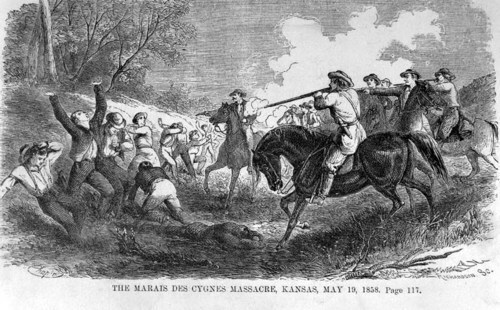 An illustration of the Marais des Cygnes Massacre in Linn County, Kansas Territory, copied from "Beyond the Mississippi" by Albert D. Richardson, 1867. In May 1858, Missourians crossed the border into Kansas Territory and murdered five Free-State men. This massacre was generally viewed as the last major violent occurrence during the territorial period. The site of the massacre is now one of the Kansas Historical Society's historic properties.